Carmen Miranda – known as the “Brazilian Bombshell” in the U.S.; as A Pequena Notável (either “The Notable Gal” or “The Notable Little One”) in Brazil – would have turned 100 today. Shot in 1938, two years before Miranda made her Hollywood debut, “O Que É Que a Baiana Tem,” is reportedly Banana-da-Terra's only surviving sequence. It also marks the first time Miranda wore her beringed, bejeweled, bedazzling Bahiana outfit – though (at least some of) Banana-da-Terra is set in Rio (as can be attested by the skyline at the beginning of the clip). Written by João de Barro and Mário Lago, Banana-da-Terra follows the Queen of Bananolândia (Dircinha Batista), as she tries to help her island-country get rid of its excess banana production by exporting the fruit to (of all places) Brazil, where apparently people eat more bananas than they produce. Also in the cast were Oscarito, who might be described as a sort of Brazilian Totó or Cantinflas or Bob Hope, Linda Batista (Dircinha's sister), and Aloysio de Oliveira. I'd never seen “O Que É Que a Baiana Tem” until a few minutes ago, but it's already my favorite Carmen Miranda number. Her “The Lady in the Tutti-Frutti Hat” from The Gang's All Here (1943) may be more extravagant, while her other show-stoppers in 20th Century Fox productions of the early 1940s may have been all impeccably produced – and in color – but it's the very simplicity of the “O Que É Que a Baiana Tem” number, shot in plain, old black and white, now extant in a faded, scratchy print, that I find, despite (or perhaps because of) its zesty rhythms, immensely moving. Carmen Miranda's sister, Aurora Miranda (Phantom Lady, The Three Caballeros) died at age 90 in Dec. 2005. A Van Johnson Tribute featuring two of his most successful films, The Caine Mutiny (1954) and Thirty Seconds Over Tokyo (1944), will be held on Thursday, Feb. 26, at 7:30 pm at the American Cinematheque's (website) Aero Theatre in Santa Monica (1328 Montana Avenue). Johnson died last Dec. 13 at the age of 92. Of the two Van Johnson films screening at the Aero, I've only seen The Caine Mutiny (top photo, with Johnson, Robert Francis, and Fred MacMurray), directed by Edward Dmytryk, one of the Hollywood Ten and the only one in that group who was able to resume his career after performing a radical turnabout and denouncing his colleagues to the House Un-American Activities Committee. Dmytryk was an interesting director in the 1940s (check out his films noirs Murder, My Sweet and Crossfire), but his work in the 1950s and 1960s – e.g., The Left Hand of God, Raintree County, The Young Lions, Where Love Has Gone – tended to be way subpar. The Oscar-nominated The Caine Mutiny, however, is among the director's most accomplished efforts of that latter period even though it's hardly what I'd call a great – or even a good – film. The good (actually great) thing about this cinematic adaptation of Herman Wouk's Pulitzer-winning 1951 novel is Humphrey Bogart's surprisingly effective performance as the paranoid Captain Queeg, whose men decide to rebel against his tyranny and incompetence in the last days of World War II. The bad thing is that in those super-nationalistic days – only a handful of years after the end of WWII and around the time of the Korean War, when just about everyone was supposed to wave the flag at all hours (perhaps so as not to be subpoenaed in front of some Patriotic Committee or other as Dmytryk himself had experienced first hand) – The Caine Mutiny twists things around in such a way that the deranged captain ends up portrayed as a sympathetic victim while the mutineers ultimately come across as either misguided or cowardly assholes. In other words, never challenge military leaders. Talk about a profound moral lesson. 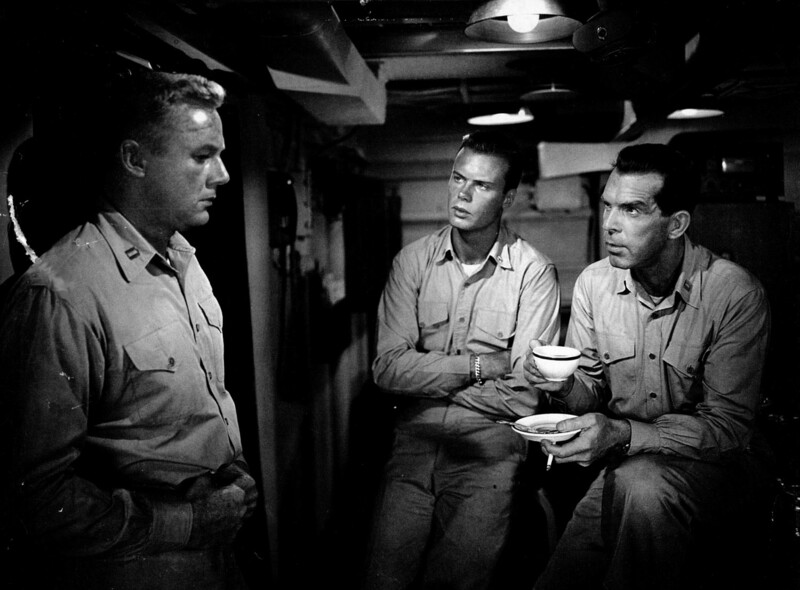 Also in the Caine Mutiny cast: Jose Ferrer, Lee Marvin, Best Supporting Actor Oscar nominee Tom Tully, and E.G. Marshall. I haven't mustered enough courage to sit through Thirty Seconds Over Tokyo stretched into 138 Hollywood Minutes. That said, in addition to winning an Oscar for best special effects this Mervyn LeRoy-directed wartime drama, based on Robert Considine and Ted W. Lawson's fact-based book, was adapted by none other than Dalton Trumbo, another of the Hollywood Ten. Look for insidious Red propaganda in it … not that you will necessarily find any. In the cast: in addition to Johnson (as Lawson), you'll find Spencer Tracy (as aviator James Doolittle), Robert Walker, Robert Mitchum, Bill Williams, and Phyllis Thaxter. Other Cinefest 2009 highlights include an auction, a special 35mm show at Eastwood's Palace Theater, film-related dealer rooms, and appearances by film historians, among them Leonard Maltin. Silent films will include live piano accompaniment provided by Philip C. Carli, Makia Matsumura, and Donald Sosin. And it's worth noting that many of Cinefest's films are one-of-a-kind prints that haven't been publicly seen in decades – and that may remain unseen for decades to come. In other words: this may be your one chance to discover cinematic treasures long hidden in vaults. Special 35mm-print presentations of The Shopworn Angel (1928), a romantic melodrama starring a very young Gary Cooper and pert Nancy Carroll, both on their way to becoming two of Paramount's biggest stars; Twenty Dollars a Week (1924), with future Oscar winners George Arliss and Ronald Colman; and Michael Curtiz's A Million Bid (1927), with Dolores Costello (Drew Barrymore's lovely grandmother), Malcolm McGregor, Betty Blythe (who caused a sensation in 1921 in The Queen of Sheba), and Warner Oland, the Swedish actor best known for playing the Chinese villain Fu Manchu and the Chinese hero Charlie Chan. The Universal musical-comedy The Boys from Syracuse (1940), from the Richard Rodgers & Lorenz Hart stage hit, with Allan Jones, Irene Hervey, Martha Raye, and Joe Penner. The Boys from Syracuse, by the way, had its world premiere in (where else?) Syracuse on July 18, 1940, where the film opened simultaneously at three downtown movie theaters. Courtesy of Rochester's George Eastman House, Cinefest audiences will be able to catch a glimpse of Joan Crawford's private life by way of personal home movies shot in the 1940s, in which the superstar can be seen strutting her stuff on the set and at home. Also: Enter Madame (1934) with Cary Grant and Elissa Landi; The Desert Song (1929), an early musical starring John Boles and Carlotta King (and with Myrna Loy in a small role); the pre-Coder Safety in Numbers (1930, see suggestive photo above) with Carole Lombard and Charles Buddy Rogers; and The Perfect Specimen (1937) with Errol Flynn and Joan Blondell. And more: King Vidor's Love Never Dies (1921), with Madge Bellamy and Lloyd Hughes (a handsome, likable performer who should have been a much bigger star); Paddy the Next Best Thing (1933), with box office sensation Janet Gaynor (right) and Warner Baxter; the 1916 Mary Pickford vehicle Less Than Dust; and the classic White Gold (1927), starring the exotic Jetta Goudal (who pretended to be French though she was actually Dutch and Jewish – and who threatened to sue Volkswagen for naming one of their vehicles “Jetta”). And still more: The Lady Who Dared (1931), one of Bilie Dove's few important roles in talking pictures; They Shall Pay (1921), with Mary Pickford's little-known sister Lottie Pickford; Beggar on Horseback (1925), starring Edward Everett Horton, Betty Compson, and Esther Ralston; and the only one of those films that I've seen, Back Pay (1922), Frank Borzage's surprisingly effective melodrama about traditional values vs. the modern world, with Seena Owen doing excellent work as a small-town girl who must choose between True Love and big-city hues. Note: All titles are subject to change. Cinefest will also include a Saturday afternoon appearance by author and film historian Norman O. Keim, who will be signing copies of his book Our Movie Houses: A History of Film & Cinematic Innovation in Central New York from 4-5 pm. “In addition to his annual Cinefest appearance, Dr. Philip C. Carli is famous for his annual performances at the British Silent Cinema Festival in Nottingham, England and the Giornate del Cinema Muto in Pordenone, Italy, the Vintage Film Festival in Cobourg, Canada and various American film festivals. Dr. Carli is also collaborating with the Museum of Modern Art on a film series tied to their exhibition of classic film poster art. “Makia Matsumura is a graduate of the Tokyo National University of Fine Arts and Music and The Juilliard School, as well as being an accomplished composer. She has performed with the Hungary National Symphony, the Berlin Great Radio Orchestra and the Tokyo Symphony Orchestra. Her live piano accompaniment for silent films has been performed and enjoyed at various screening venues throughout the U.S. and Japan. The registration fee for all four days is $70.00 or a daily charge of $25.00. The fee includes admission to the hotel's film screenings and the memorabilia dealers' rooms. Film showings begin at 9:00 am on Thursday and run through 5:00 pm on Sunday. Separate admission for the 35mm program is $25.00 and includes bus transportation from the hotel to the Palace Theater and back to the hotel at the conclusion of the 35mm program. The motion picture related memorabilia dealers' rooms will be open to the general public on Saturday from 10 am to 5 pm. Photographs, posters, DVDs and videos, books and miscellaneous movie related items will be on sale. Admission to the dealers' rooms on Saturday is $5.00 and may be credited toward a full day's Cinefest admission. Established by the late Phil Serling in 1980 and presented by the Syracuse Cinephile Society, Cinefest will be held at the Holiday Inn on Electronics Parkway in Liverpool, NY. For more information, please contact Gerry Orlando at (315) 468-6147 before Wednesday, March 18. “Adrian: Nothing from a Store,” a lecture on designer Gilbert Adrian (best known as Adrian) and his time working with Cecil B. DeMille will be presented by author Richard Adkins, who's currently working on an Adrian biography, on Wednesday, March 11, at 7:30 pm at at the Hollywood Heritage Museum's (website) Lasky-DeMille Barn at 2100 North Highland Avenue (across from the Hollywood Bowl). Adrian, actress Janet Gaynor's husband from 1939 to his death in 1959 (theirs was a curious relationship), began his Hollywood career in the mid-1920s. He became associated with DeMille in 1925, later rising to the position of head of the costume department at the DeMille (later Pathé-DeMille) studio. When the producer-director moved his company to the MGM lot in late 1928, Adrian went with him. From then on, Adrian's reputation skyrocketed, as he (over)dressed the likes of Joan Crawford, Greta Garbo, Norma Shearer, Jean Harlow, and Myrna Loy. Tickets: Hollywood Heritage Members: $5.00. Non-members: $8.00. Free parking, and refreshments available. For the third consecutive year, the Art Directors Guild (ADG) Film Society and the American Cinematheque (AC) are co-hosting a series of monthly screenings highlighting the work of legendary production designers, art directors, and set decorators. The screenings, beginning on March 29, will take place at both the Lloyd E. Rigler Theatre at the Egyptian (6712 Hollywood Boulevard, Hollywood) and the Max Palevsky Theatre at the Aero (1328 Montana Avenue, Santa Monica). and clips from both the 1960s Star Trek TV series and the upcoming big-screen release (above). The season kicks off with a double bill “Robert F. Boyle Centennial” as a tribute to the legendary and iconic production designer, who will celebrate his 100th birthday in October. The Wolf Man (1941) and Gaily Gaily (1969), two of Boyle's most amazing examples of imaginative production design, will be shown. The Wolf Man, which stars Claude Rains, Lon Chaney, Jr., Warren William and Ralph Bellamy, is the classic story of a man's transformation into a werewolf. The film is recognized as one of the iconic Universal monster pictures, taking place in classic old European castles, villages and misty forests, all accomplished within the studio lot. Gaily Gaily, on the other hand, mixes both real locations and the backlot to seamlessly create turn-of-the-century Chicago. Starring Beau Bridges, the film is about an innocent young writer who learns the ways of yellow journalism while working for a top Chicago paper. Boyle's sets include a revamp of the backlot, in which he added an elevated train, as well as a newspaper office, the entire stock exchange, and one of the most beautiful and opulent bordellos ever put on film. 2008 Academy Award® honoree Boyle will be personally present between the screenings to participate in a discussion to be moderated by Production Designer John Muto. The April screening will focus on the theme “Designing for World War II” by showing John Ford's classic film, They Were Expendable (1945) by art director Malcolm Brown and photographed in stunning black and white by Joseph H. August ASC, co-founder of the American Society of Cinematographers. Based on the book by William L. White and starring Robert Montgomery, John Wayne, Donna Reed, Ward Bond, and a classic ensemble of some of Ford's favorite players, this classic naval war film is a dramatized account of the role of the American PT boats in the defense of the Philippines during World War II. Production Designer Tom Walsh will moderate a panel discussion following the screening. In May the series will look at “Designing for Science Fiction” by showing two versions of the same film created in different decades, Flash Gordon (1936 & 1980) and honoring art directors Ralph Berger and Danilo Donati, respectively. Based on the 1930s comic strip, the plot follows the adventures of Flash Gordon, Dale Arden and Professor Zarkov, who travel to the planet Mongo and find themselves fighting the tyrant, Ming the Merciless, to save Earth. Art Director Steve Berger, son of the original FLASH GORDON Art Director Ralph Berger, will be present to participate in a discussion, along with a panel of distinguished film artists between the screenings, to be moderated by John Muto. Island at the Top of the World (1974) will be shown in June with a “Designing for Adventure” theme. Designed by Peter Ellenshaw, the film was nominated for an Academy Award® for Best Art Direction. Starring David Hartman and Donald Sinden, the film tells the story of a father who puts together an expedition team to find his son, who vanished while searching for a long-lost Viking community somewhere in uncharted Arctic regions. A panel of distinguished film artists will follow, moderated by John Muto. The July screening focuses on “Designing for 3 Strip Technicolor” with a screening of Black Narcissus (1947), designed by Alfred Junge. Junge won an Academy Award® for his art direction in this film. Actresses Deborah Kerr, Flora Robson and Jean Simmons star in this film about a group of nuns who attempt to establish a religious community high in the Himalayas. Not only do they have to contend with suspicious locals and the elements, but their own demons emerge as well. The film is justly famous for its Himalayan scenery, every frame of which was photographed on the studio's backlot and stages in England. A panel discussion will follow, to be moderated by Tom Walsh. “Designing for the Backlot” is the theme for the August screening, where the film The Chase, designed by Richard Day (My Gal Sal, A Streetcar Named Desire, On the Waterfront) will be shown. Directed by Arthur Penn, screenplay by Lillian Hellman from the play by Horton Foote, and starring Marlon Brando, Jane Fonda and Robert Redford, the film portrays how the escape of one man from prison, in one night, profoundly affects the inhabitants of a small Southern town. A panel discussion will follow with leading production designers who will further discuss the creation and use of backlots in film. In September the theme of the screening will be “Designing for Star Trek: Past and Future.” Created by Gene Roddenberry, the original television series was nominated for five Emmy Awards® from 1967-1969. In mid-2009, Paramount Pictures will release a new Star Trek, starring Chris Pine, Zachary Quinto, Eric Bana and Simon Pegg. Clips from the original television series and past feature films, as well as the 2009 film release, will be shown in tandem with a unique panel discussion amongst leading designers, effects artists and veteran alumni –both past and present– of this enduring cinematic franchise. The final film in the series, The Boy Friend (1971), designed by master production designer, Tony Walton, will focus on the art of designing musicals for the screen. Director, producer and screenwriter Ken Russell tells the story of an assistant stage manager (played by Twiggy) of a threadbare theatrical troupe, who has to take over for the injured leading lady at a matinee when a Hollywood director just happens to be scouting for actors. She also happens to secretly be in love with the leading man (Christopher Gable) - and she imagines a series of spectacular musical fantasy numbers starring the two of them. A distinguished panel of design and musical theatre professionals will participate in a discussion at the end of the screening. Representing the ADG are president, Thomas A. Walsh and production designer, John Muto. Working with them are the American Cinematheque's Gwen Deglise and Chris D. The series is in part sponsored by trade publication Below The Line. General admission: $10. American Cinematheque members: $7. Students/Seniors with valid ID: $8. All screenings start at 5:30 p.m. 24-hour ticket information is available at 323-466-FILM (3456). 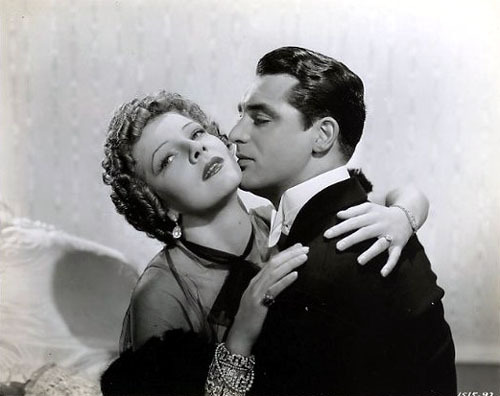 Ronald Colman Actor: From Mad Killer to Lovestruck Amnesiac & Should Humankind Be Spared? Hi André! I thought that there were two clips from “Banana da Terra”, this one and the one she sings with Aurora “Nos somos as cantoras do Radio..;” where we can see them singing and dancing in silver top hats. It's a pity we can't see these movies nowadays. I'd love see a Brazilian movie with Carmen. According to what I've read, Carmen Miranda and Aurora Miranda sing “Nós somos as cantoras do rádio…” in Adhemar Gonzaga's “Alô Alô Carnaval” (1936). Hi. “Pequena Notável” in portuguese means “The Notable Little One”. I think that I as a brazilian could help you with this little translation. This is just beautiful. Ms. Miranda was so fun to watch and oh so gracefully amusing. I actually have seen this before back at my university days, when they had a screening about latin movie stars in the 1950's.